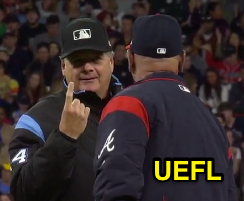 2B Umpire Jerry Layne ejected Braves Manager Brain Snitker (pace of play, mound meeting, delayed substitute pitcher entry, and time for warmup; QOCU) in the bottom of the 3rd inning of the Phillies-Braves game. With two out and two on, Phillies Manager Gabe Kapler made a pitching change to replace Vince Velasquez with Hoby Milner. After initial confusion because no pitcher was warming in the Phillies bullpen, Milner jogged to the infield and met with Kapler, catcher Jorge Alfaro, and other teammates on the mound. Snitker was ejected for arguing that HP Umpire Vic Carapazza allowed Milner too much time to warm up, the call was irrecusable. * At the time of the ejection, the Braves were leading, 7-2. The Braves ultimately won the contest, 15-2. This is Jerry Layne (24)'s first ejection of the 2018 MLB regular season. Jerry Layne now has 2 points in the UEFL Standings (0 Prev + 2 MLB + 0 Irrecusable Call = 2). Crew Chief Jerry Layne now has 2 points in Crew Division (1 Previous + 1 Irrecusable Call = 2). *Pursuant to 2018 Pace of Play initiatives, "The pitching change timer shall begin as soon as the relief pitcher crosses the warning track (or foul line for on-field bullpens) to enter the game." At 25 seconds on the countdown timer, the pitcher shall throw his last warmup pitch; at 20, the batter is announced or returns to home plate, and at zero, the windup or motion to come set shall begin. Relevant to the Milner play, Milner, who had to be summoned by 3B Umpire Greg Gibson, physically crossed the warning track a significant amount of time after Vasquez was removed from the game, and the pitching break clock accordingly did not start until Milner actually stepped onto the field. Snitker's ejection actually occurred with more than 25 seconds remaining on the timer, meaning that Milner was not yet on his pace-of-play-mandated final warmup pitch. According to the rules, it was all legal. Gil's Call: This is actually one loophole in the pitching change timer rule. Though Milner is subject to a 2-minute, 5-second timer (regional game), the timer does not start until Milner crosses the warning track from the Phillies' outfield bullpen. Milner delayed his entry from the 'pen so that Gibson had to run out and finally coax him in, which is gamesmanship, but not necessarily an explicit rules violation. Rule 5.07(c) ["Pitcher Delays"] and similar Rule 6.02(a)(8) ["The pitcher unnecessarily delays the game"] also wouldn't apply, since 5.07(c) and 6.02(a)(8) [and related rule 6.02(c)(7)] only apply to pitchers already in the game. Meanwhile, Rule 7.03(a)(2) specifies the one and only penalty for a team that "employs tactics palpably designed to delay or shorten the game." The answer is the same as the section's title: "Forfeited Games." Seems to drastic a step for this situation, yet these are the only rules that address team delays. Thus, Milner got "free time" to warm up while in the bullpen because the timer starts only when he crosses the foul line, NOT when the manager visits the mound to replace the original pitcher. This is the fourth ejection of the 2018 MLB season. 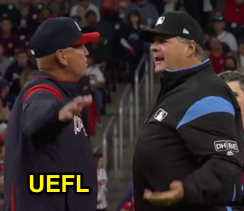 This is the 3rd Manager ejection of 2018. This is Atlanta's 2nd ejection of 2018, 1st in the NL East (ATL 2; MIA, NYM, PHI, WAS 0). This is Brian Snitker's 2nd ejection of 2018, 1st since March 29 (Jordan Baker; QOC = Y [Check Swing]). This is Jerry Layne's first ejection since September 10, 2017 (Terry Collins; QOC = Y [Replay Review]).